I would like to tell you about newest workshop coming soon. I am Yuta Nakajima, Japanese artist. 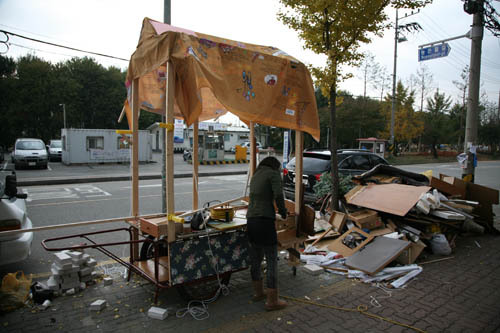 I am going to held the workshop using the Korean style stand "pojangmacha" at the visiting Community Space LITMUS. The small pojangmacha made by collected trash in whole town which is inspired by local people job is the site to get together. Feel free to join this project, you come to get together to do any things you want. Some people may be talking about something, Others may be singing some songs, dancing, making a art works, doing workshops, advertising and doing nothing else. What I would like to do is "I would like to meet YOU to talk ". many different kinds of countries. local people's job, to people get together to talk about many things. create something with collecting materials. 6th November is the day to get together. The day is to collect “collecting". The day is to collect “wanna get together again". title : A〜HA〜!!! some collections!! need, the bins of Soju (CharmeeSle and ChuumChurum) and any red color things.